The first cohort of five gene-edited monkey clones made from fibroblasts of a monkey with disease phenotypes were born recently at the Institute of Neuroscience (ION) of the Chinese Academy of Sciences (CAS) in Shanghai. The expression of BMAL1, a core circadian regulatory transcription factor, was knocked out in the donor monkey using CRISPR/Cas9-mediated gene editing at the embryo stage, and the fibroblasts of the donor monkey were used to clone five monkeys using the method of somatic cell nuclear transfer, the same method that generated Zhong Zhong and Hua Hua, the first two cloned monkeys, last year. This major advance, reported in two articles in the journal National Science Review on January 24, demonstrates that a population of customized gene-edited macaque monkeys with uniform genetic background will soon be available for biomedical research. The first article describes the generation of gene-edited donor monkeys using CRISPR-Cas9 to edit the BMAL1 gene of in vitro fertilized monkey embryos. These monkeys exhibited a wide range of circadian disorder phenotypes, including reduced sleep time, elevated night-time locomotive activities, dampened circadian cycling of blood hormones, increased anxiety and depression, as well as schizophrenia-like behaviors. "Disorders of circadian rhythm could lead to many human diseases, including sleep disorders, diabetes mellitus, cancer and neurodegenerative diseases. Our BMAL1 knock-out monkeys could thus be used to study the disease pathogenesis as well as therapeutic treatments," says Hung-Chun Chang, senior author and investigator of the Chinese Academy of Sciences Institute of Neuroscience. The second article describes the cloning of macaque monkeys from the fibroblast of a BMAL1-knockout monkey using the method of somatic cell nuclear transfer. In this method, the researchers removed the nucleus from a monkey oocyte (egg cell) and replaced it with another nucleus from a fibroblast, a differentiated somatic (body) cell. This reconstructed egg then developed into an embryo that carries the genes of the replacement nucleus. The embryo was then transferred to the womb of a surrogate female monkey that later gave birth to the cloned monkey. In the previous work, Zhong Zhong and Hua Hua were generated by using fibroblasts from an aborted fetus. The present work succeeded in using fibroblasts from a young adult gene-edited donor monkey with disease phenotypes. 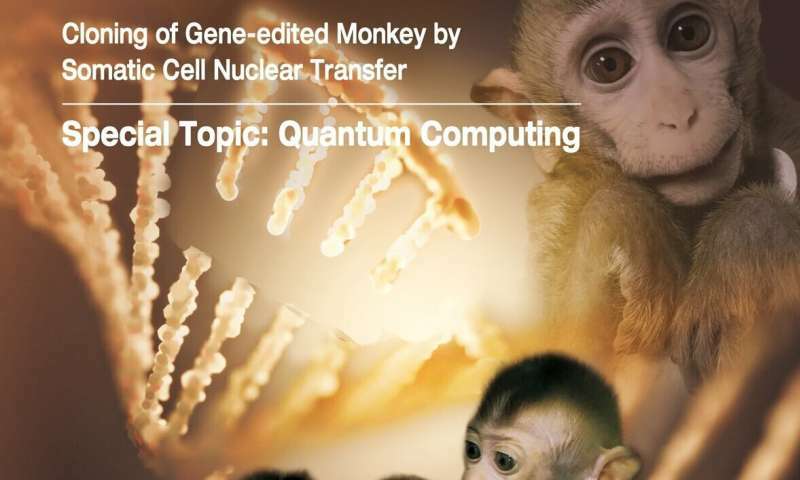 "Our approach is to perform gene editing in fertilized embryos to first generate a group of gene-edited monkeys, and then select one monkey that exhibits correct gene editing and most severe disease phenotypes as the donor monkey for cloning by somatic cell nuclear transfer," says Qiang Sun, senior author of the paper and director of ION's Nonhuman Primate Research Facility. "We believe that this approach of cloning gene-edited monkeys could be used to generate a variety of monkey models for gene-based diseases, including many brain diseases, as well as immune and metabolic disorders and cancer." The researchers plan to continue improving the technique in order to increase the efficiency of cloning. The group is expecting more macaque clones carrying disease-causing gene mutations to be generated in the coming years. The Institute of Neuroscience, CAS is following strict international guidelines for animal research. "This work required coordinated efforts of many laboratories, and serves as a clear example of the efficient team work that is highly emphasized by CAS" says Mu-ming Poo, A co-author on both studies, who directs the Institute of Neuroscience and helps to supervise the project. "This line of research will help to reduce the amount of macaque monkeys currently used in biomedical research around the world." "Without the interference of genetic background, a much smaller number of cloned monkeys carrying disease phenotypes may be sufficient for pre-clinical tests of the efficacy of therapeutics," Poo says. Are you familiar with Dr. Wu's body of work?